After World War II, the U.S. Military required a modern-day cargo and troop transport aircraft to replace their aging mixed fleet of piston engined aircraft. On August 23, 1954, the first C-130A “Hercules” took to the skies in what was heralded as the beginning to the most successful military transport turboprop to be conceived. The C-130 has been recognized alongside the venerable DC-3 as the world’s most versatile aircraft flying for more country’s forces, than any other aircraft. The Hercules is capable of hauling 36,000lbs, of payload over distance exceeding 3,800 miles. 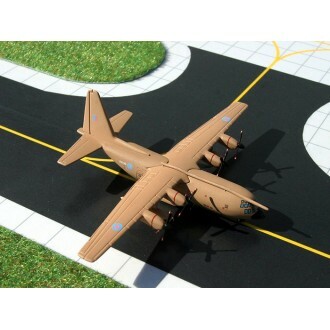 Its short field performance is truly amazing with the ability to land and take off on unprepared runway surfaces. The popularity of the C-130 is prevalent the world over and can be seen operating from the frozen Antarctica to the hottest desert’s of Africa and the Middle East. The “Hercules” can haul troops, passengers, cargo, livestock, outsize freight or anything else that will fit within its dimensions. The C-130 has been manufactured in various fuselage lengths and has also been used as a civilian airliner/freighter (designated the L-100). The latest military version, identified as the C-130J model, now features the most modern cockpit technology available. Improved engines and multi-blade propeller design have now brought the C-130 to current standards. Now entering its 50th year of production, the C-130J will carry the Hercules tradition well into the 21st. Gemini Macs by Gemini Jets are Military Aircraft in 1/400 scale from around the world. They work perfectly with the Gemini Jets Airport and Accessories.